Do You Suffer From Bible Anorexia? 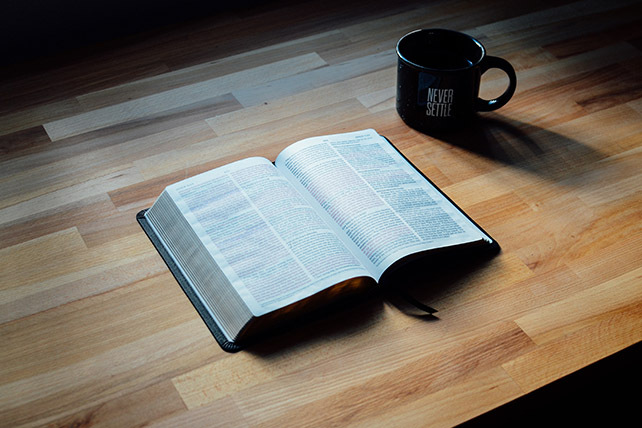 Home Pastors Articles for Pastors Do You Suffer From Bible Anorexia? I had a friend in high school named Julie who had anorexia nervosa. Anorexia is a disease that ravages some women, causing extreme weight loss from a refusal to eat. This leads to abnormal blood counts, fatigue, thinning hair, irregular heart rhythm, and low blood pressure. The scary thing is that girls and women with anorexia can’t see how thin they are. When they look in the mirror, they don’t notice the bones protruding. In fact, they may even think they see fat. This woman was busy with much serving in the church. She was part of the music team and helped in the children’s ministry, but she didn’t realize she needed the Scriptures for regular and personal spiritual nourishment at home. To her, Bibles were for church meetings. She thought a meal here and there would sustain her. She was unhappy in life and couldn’t see that she was thinning out spiritually, even in the midst of all her serving. She had Bible anorexia. God calls his Word bread, milk and honey. He has graciously given it to us to keep us alive and enable growth. Second Peter 1:3 says, “[God’s] divine power has granted to us all things that pertain to life and godliness, through the knowledge of him who called us to his own glory and excellence.” Notice that God’s divine power works through knowledge of Christ. This is why the Bible is the main course on our spiritual menu. Paul also repeatedly exhorts his readers to grow in their knowledge of Christ. In his letters, he teaches about Christ and encourages others to teach about Christ. He prays in Philippians 1:9 “that your love may abound more and more, with knowledge and all discernment.” In the modern world, we think of love as simply a feeling, but God wants our love to abound in knowledge. As our knowledge and discernment grow, our love is purified and we bear fruit that redounds to the glory of God. Just as we eat to fuel every cell in our bodies, we read and hear to power our hearts and souls. Just as individual Christians can have Bible anorexia, churches can starve too. Cutting-edge music, artistic videos and clever illustrations can build a crowd, but God’s Word is what the Holy Spirit uses to build a church. Sadly, the Bible is being sidelined today in many church gatherings. Even “Bible-believing” churches no longer read substantial portions of the Bible when they gather. Perhaps because they consider it too boring. Biblical truths in hymns and songs have given way to more emotive expressions of how we feel about Jesus, or how he makes us feel. As for the sermon, too often it has been relegated to 20 minutes of moving stories and cultural commentary to break up the monotony of the “preaching.” After all, we now live in a digital age and our attention spans, we’re told, are shorter than those of goldfish. In contrast, here’s what Paul tells the church: “Let the word of Christ dwell in you richly, teaching and admonishing one another in all wisdom, singing psalms and hymns and spiritual songs, with thankfulness in your hearts to God” (Col. 3:16). God’s Word reverberates through a church that gathers to read, pray, sing and hear the Word of God. That Word dwells deeply and spreads inside and out. The church grows strong, truly becoming “a pillar and buttress of the truth” (1 Tim. 3:15). If only more churches reverberated with open statements of the truth (2 Cor. 4:2) to produce Christians who are growing and mature. The Bible alone, empowered by God’s Spirit, is sufficient for this work. Individual Christians and their churches must fill themselves with the Scriptures. A banquet of Christ awaits us. Let’s not starve but enjoy the feast! Keri Folmar lives in Dubai, where here husband John serves as the senior pastor of the United Christian Church of Dubai. She's the author of several books, most recently The Good Portion: The Doctrine of Scripture for Every Woman.